Whilst Not Even A Bag of Sugar is my main blog, and not as busy these days due to my other commitments, I also have another one, Kykaree. I wrote a post today about love. I don't know about you, but I had a strong image in my head of how I would fall in love with my baby. Yes I loved my baby in the womb, but whilst a baby is inside there is so much uncertainty. You don't truly know what will happen, what your baby will be like. I only really considered a labour. Working hard to bring my baby into the world. Hot, sweaty, in pain, and finally the baby emerging, being placed on my chest and with my husband's hand around my shoulders, getting to know this brand new life. Feeling the rush of love, the release of hormones as breast milk is let down, slowly getting to know this lovely new life, this precious baby. When your baby is born sick and/or premature, the above is not the reality. For me birth was as highly medicalised as it can get. I didn't see my baby when he was born. I didn't know him. Possibly the hardest thing was, he had never seen me. The first person who held him wasn't me. He was placed on a table and worked on, putting up the fight of his life, the first of many. I could have chosen to shut off, to wait and see. And some parents do, and that's ok too. Self protection is a natural instinct. I had this strong instinct to just love him, and to bond. I felt a strong attachment to him straight away. Even though I didn't even see my first picture of him til 2pm. He was born at 10am. Love is hard work. It's about truth, about honesty and about faith. When your faith in everything has been shattered by premature birth, or giving birth to a baby who is sick, that love can be interrupted. I'd love to hear your thoughts, my reader. Did you love your baby straight away? Was it a decision or completely natural? I strongly believe that the decision to love Joseph was the best one I ever made. Whatever regrets I have about his birth and early months take a back seat to those precious memories of loving him, as he was and as he is. I had the very great pleasure this morning to be invited onto the Eamonn O'Neill show this morning on BBC Radio Manchester. If you missed it you can hear it here. Radio is a beautiful medium. My grandparents lived in Lilydale in Tasmania for the first 7 years of my life, and I stayed there often. All they had was "the wireless" no, broadband or internet back in those days, the wireless was a very old, beautiful radio. All our news and entertainment came from Radio. Now in my 40s I find myself the same, listening to Radio 4 and Radio 2 with the occasional foray in Radio 6. I am so grateful for the support of the BBC, I have been on Radio 5 Live, Radio London and Radio Manchester on several occasions. I have a passion for the medium. Blogging has been very good to me. What I didn't get the chance to say today was this. Sally and the team at The MADS do a marvellous job not only arranging the awards but being true ambassadors for the medium. I love blogging, and as I said in my interview I am evangelical about it. I want everyone to try writing a blog! We are looking for bloggers to write about their experiences of special care, and raising their special children for the Bliss blogging section of the website. Please contact me at kylieh@bliss.org.uk if you are interested. Blogging is a lovely way of getting your thoughts and feelings across and I am so grateful for every opportunity I have been given and for the skills, friendships and perks I have gained through blogging. Thank you to all of you who supported for me and cared for me in the time this blog has been running. And here's to many more years of Not Even A Bag of Sugar in one form or another. 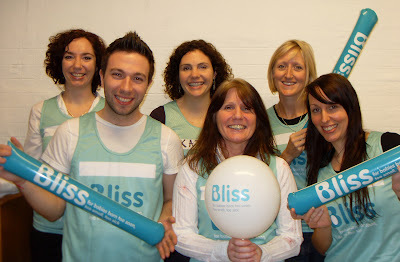 As most of you may know I now work for Bliss the charity for premature and sick babies. I first came across Bliss as a service user, a stressed scared parent, then as a volunteer. My first volunteer role was on the Parent's Panel for the Little Bliss magazine. At my first meeting I was greeted by Mark Gorman, the editor. Mark struck me with his passion for Bliss, and his willingness to learn from parents. He was always ready to listen, to be challenged, to take on ideas and to champion our causes and interests. The way we have been able to direct Little Bliss and focus it for families has been truly amazing, and its down to Mark trusting us. Mark is also hilariously funny, and slightly mad. So mad he is running a marathon for Bliss. No that's not actually the whole story. Mark is running 3 marathons for Bliss in consecutive weeks. Kicking off in Paris on the 7th April, followed by Brighton on the 14th April culminating in London on the 27th April. You have to admit that's just so inspiring. Mark has such a passion for Bliss, and for the tiny lives we take care of. He is truly an inspiration. I am immensely proud to be part of the Bliss family, and very proud of Mark. Last night I attended a mad quiz night to help raise money towards the marathon effort, and we had so much fun, weirdest quiz I've ever been to, but it was awesome to see just how much support Mark has. I really want each of you to dig deep. If each of you who read this gave £1 that would really help. Please dig deep and help Mark achieve his goal. I will aim to match the donations given by my readers. If you donate leave a comment or Tweet me so I can tally it up and match it. And just to totally embarrass the poor guy, watch this! I came across this very thought provoking collection of stories on The Guardian website today. For those of us who have had our babies prematurely or poorly I think regret is something we live with daily. Three years ago the question "what is your biggest regret as a parent?" would have been simple to answer. "Not carrying to term". Now my life has changed its hard to regret that, in a sense. I have a happy healthy almost four year old boy, who is in sound health. I have a career that I love, and a happy life really. Two years ago that question would have been easy too "not enjoying him as a baby enough". I didn't keep diaries but I did keep the blog and a good record on Facebook and Twitter and plenty of photos. I have lots of stories and anecdotes. I did enjoy Joseph's baby time and early toddler time. Yes it was marred by mental health problems to some extent, but we had a ball. I found reading these stories really intriguing. Funny regrets like shouting at teenagers in a cinema thus causing the reader's daughter to never ever go and see a movie with her mother again, to regretting adoption of a baby. For those of us who have had a premature baby, I think along with letting go of guilt, letting go of regret is a very difficult thing to do. It's only as the years have unfolded and our journey has continued, that really, I have nothing to regret. There was nothing I could do to change Joseph's early arrival. I did the best I could when he was in hospital. I regret having little support or advice. Regret is a sad emotion. Regretting what we have done, or what we haven't is so futile. However, I am in a place now to help others, and prevent some of those regrets for other parents. Regret is, therefore, in some respects, not a worthless emotion, it can be a power for good, to try and change the future if not for ourselves, for others. I feel sad for some of these families, and happy too, for example one mother regrets tipping a bowl of spaghetti over her daughter's head. Probably not a bright move, but if that is the only thing I have to regret once Joseph is an adult, I will be happy. This year I took the unusual step of asking not to be nominated for a MAD Blog Award. There were two main reasons for this. The first is that when the award nominations were taking place, I wasn't actively blogging, having just started my new job. The second reason is this. Being nominated for Most Inspiring Blog in 2011 completely changed my blogging life. It gave me confidence that I did, in fact, have something to say. It gave me confidence as a writer, and it also gave me confidence as an activist. I felt I could sell myself to charities and to PR agencies. I met amazing people in the lead up to the ceremony, and at the event itself. I adored the whole experience and wanted other bloggers to get the same opportunties I have had. Yesterday my good friend Jennie shared the news that she had been nominated for the 2013 Outstanding Contribution Award. I was thrilled for her! I clicked on the link to check out the competition, so many of my favourite bloggers, many of whom I consider good friends. And then I saw it. Not Even A.... um, that's me! Not Even A because Kylie is an absolute rock for Mums in the premature baby community, generous with her time and advice. Kylie campaigns tirelessly for Bliss and baby charities to raise awareness of neo-natal care, and has inspired bloggers in the past year by overcoming huge adversity and still sharing support with other members of the community. That just means the world to me. I love our special premature and sick babies, and I am passionate about parents. Being a parent of any baby is hugely daunting and terrifying at times, as much as it is wonderous, and being the parent of a premature baby presents its own unique challenges. I have worked hard and done my best to be true and to be honest. So many times I have received messages saying "thank you, I didnt know it was ok to feel like that". Being able to get alongside a mum or dad and say "I don't have the answers, but I am right beside you" is what Not Even A Bag of Sugar is all about. I'm not an expert. Just a mum. A mum who found having a premature baby completely rocked her world to its core, and struggled with fear, anxiety and anger. Who at times felt like she was flying she was so happy, and then would come crashing down in a screaming heap. She realised, over time, this roller coaster is completely normal, and that others needed to know it was normal too. 2012 was tough. I learnt some hard lessons, that although my trauma with Joseph is pretty much over, that my own personal childhood trauma is not. I learnt I hadn't really nurtured friendships and felt alone. I learnt that friendship comes in all shapes and sizes. I have learnt so much about myself, and have come out of it a better person, and a better writer. But it hasn't been easy. I have been so blessed that through blogging I have found my calling and now work for Bliss in a job that I dearly love, helping other parents by recruiting and supporting volunteers. This category, and it deserves its own post, contains the most amazing group of women, all of whom I have met. All of whom have their own unique stories and writing style. All of whom are role models and outstanding. It really does not matter now what happens. I feel blessed to have been recognised, and I tell you what, boy am I looking forward to the party!!!! Thank you to each and every one of you who thought of me, and to Sally and the team. I always have mixed feelings on Mother's Day. Joseph was born 3 days before Australian Mother's Day, the second Sunday in May. To me that is true Mother's Day, for all that this one is more traditional. I loved that my Aussie friends sent me little messages on Facebook wishing me happiness on my first Mother's Day with a baby that I could not hold. But he was here, and finally I could call myself a mother. For so many people Mother's Day is a very tough day for many reasons. Perhaps their own mothers are no longer with them. Perhaps they are estranged from their mothers, or past hurts have interrupted that bond and the day brings painful reminders, and reinforces the relationship they would have like to have had but do not. There are mothers like Jennie at Edspire who face Mother's Day with a heavy heart, as they mourn a child. And also celebrate with the children that are still living. There are those who have had babies who could not stay. Who to me are mothers, but the rest of the world appear childless. Those who have had miscarriages and stillbirth, rounds of IVF and other procedures. To me, the desire to be one, makes you a mother. I was reminded today of this post by my sister Penni who writes at Eglantine's Cake. I am so grateful for my son Joseph, but even today I still feel sad at the choices that we had to make, the choice that chose us, to have just one child. When my sister first wrote this I had mixed feelings, my emotions still so raw. Now I see it differently. Sometimes life is about choice, about decision making, and sometimes it isn't, it's fate, or chance, or God's hand at work, whatever you like to believe. But sometimes, the path we tread isn't of our choosing. Today has been a lovely one, relaxing, just the three of us. Homemade cards, flowers, chocolate and a book. But the greatest gift for me, is finally being a mum. I lost two babies on the way, had Joseph at 27 weeks gestation, and have had to say goodbye to my dream of being a mum of more than one child. But I am a mother. And I am happy. I didn't choose to give birth prematurely. I chose to make the biggest bottle of lemonade I could from the lemons I felt I had been given. I have a new life and a new purpose. The birth of Joseph gave me a whole new set of choices. As you reflect on your own journey today, as a mother, whether your children are with you, or not, or waiting to be born, or allocated to you, or a mother who mourns, I hope you can find peace in this day. 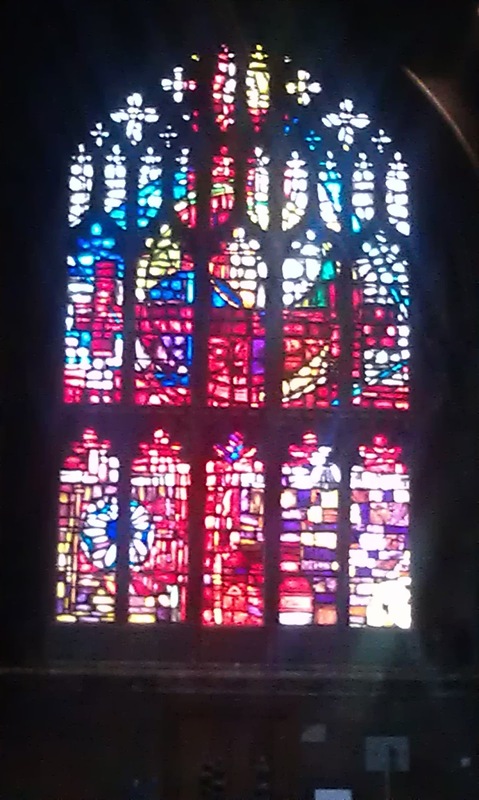 When I was asked to speak at the Saying Goodbye service in Manchester, I was deeply honoured. March seemed a long way off. As the day drew near I realised I'd need something to say. I wrote my talk, sent it to a good friend to read, and hoped that it would be suitable. I read it this morning, to a cathedral with people who understand baby loss, personally and deeply. Each person has their own story to tell, their own personal journey to share. I was humbled to see people young and old, mourning their babies. Although only a few hours ago, I already feel a lightness of spirit. It was such a healing thing to do, and I am so grateful for the opportunity to share my words. I have recorded them here for you.